KSBxFI-1 stainless steel feet for SBK and SBX load cells. Stainless steel articulated feet designed in order to obtain the best weighing performances, particularly suitable for creating scales with 4 load cells. 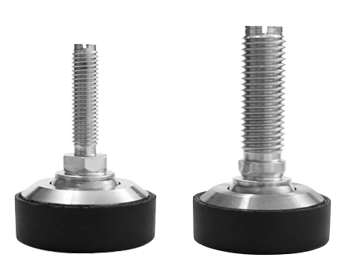 Extremely compact and easy to install, the feet minimize the height of the platform and ensure a perfect decoupling of the lateral forces during the weighing operation. Applicable on SBK and SBX load cells up to 5000kg. Designed especially for use on 4-cell platforms. Perfect decoupling of the lateral forces during the weighing operation. Extremely compact and simple to install, minimizing the height of the platform. To combine with BLKM12I/BLKM20I bush. KSB2FI-1 Stainless steel articulated foot with M12 threading. For SBX/SBK/SBT load cells with capacity up to 2500kg. To combine with BLKM12I bush. KSB5FI-1 Stainless steel articulated foot with M20 threading. For SBX and SBK load cells with capacity from 3000 to 5000kg. To combine with BLKM20I bush. BLKM12I Stainless steel M12 bush. BLKM20I Stainless steel M20 bush.